With the New York Mets down 0-2 in the World Series, they picked up their bats in game 3 and scorched the Kansas City Royals for nine runs in a 9-3 victory to shorten the deficit to one. The biggest question last night was whether Noah “Thor” Syndergaard was going to rely on his fastball or cave in to the Royals contact style of hitting and throw his secondary pitches more, just as Matt Harvey did in the first game.The question was quickly answered when Thor threw a 98 mph fastball high and inside on Alcides Escobar on the first pitch of the game. Escobar, up until that point, swung at the first pitch during the first two ballgames. He then proceeded to gain strikes with his curveball until ultimately striking out Escobar on a high fastball. The Royals stayed hot from Game 2 with Ben Zobrist doubling beyond Cespedes’ head in center field. Lorenzo Cain came to bat and hit a bouncing ball past Thor with David Wright not being able to make a play in time. All of a sudden in the top of the first, the Royals had men on first and third with one out. Eric Hosmer hit a ball to first base in which the Mets could have turned a double play to end the half inning but Lucas Duda and Thor ran into each other trying to catch the ball at first base to retrieve the third out. The Mets started the bottom half with a two-run slam to left field by the 32-year-old David Wright, who has been inconsistent this year due to his spinal stenosis disorder. The Mets ended the first inning with a 2-1 lead. The Royals continued their hot hitting in the second inning with three straight singles to add another run to make it 2-2. The Royals pitcher, Yordano Ventura, decided to play small ball with a sacrifice bunt to move Alex Rios over to third base with two outs. Travis D’Arnaud let the ball squeeze past his glove and shin guard to allow Rios to score to give the Royals a 3-2 lead. In the bottom half of the third inning Thor drove a ball into right field for a single on a 0-2 count to bring up Curtis Granderson. Ventura shouldn’t have thrown a pitch close to the strike zone on a 0-2 count to a pitcher. Granderson made sure Ventura paid for his mistake by hitting a screamer that just barely reached over the right field wall for a two-run shot. 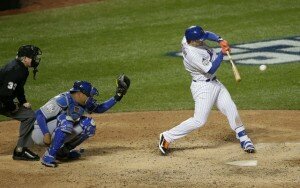 The Mets then decided to put the ball in play with three straight hits in the fourth inning to make the lead 5-3. After the lead Syndergaard really found his form by striking out the next four of five Royal batters. He started out shaky but was able to relax and control both his fastball and secondary pitches. He was very successful with his secondary pitches as the Royals batted .000 against them. Thor made the Royals hitters swing and miss 16 times in which the Royals only had 19 swing and misses during the first two games of the World Series. He also struck out eight while Harvey and deGrom only had a combined four strikeouts during the first two games. This proved to be the winning ingredient as he kept the Royals guessing between his fastball and secondary pitches while making them swing and miss. The Mets were able to add four more runs in the sixth inning due to relief pitcher Franklin Morales making a horrendous play. With a man on first and third with one out, Granderson hit the ball right at Morales that should have induced a double play to end the inning. Instead Morales looked at second, looked to third, faked to third, and then decided to throw to second base when Uribe was already reaching second base safely. Instead of being out of the inning down 6-3, the bases were loaded with one out. Old man Wright brought in Flores and Uribe on a single to bring the lead to 8-3. Granderson then hit a sacrifice fly to left field to give the Mets a 9-3 lead. The Royals have a 2-1 series lead heading into Citi Field. The 36-year-old journeymen, Chris Young, will be facing Met’s rookie Stephen Matz. Matz is the first Mets pitcher that throws a 94 mph sinker instead of a fastball. It will be interesting to see how the Royals are able to put the ball in play against a pitcher whose main pitch is not a fastball. Matz’ BABIP (batting average with balls in play) is .305 which could prove deadly for him against the Royals’ contact style of hitting. Chris Young’s OPS this year is the 4th lowest of his career at .640, which could play well with the Met’s power hitting style. The Royals will be able to put the ball in play early and often against Matz in the opening innings. Chris young will provide serviceable innings to keep them in the lead. The Royals will receive solid innings from their bullpen to move the series to 3-1 with one more game to play at Citi Field.